With industrial solar it gets much more ugly and complex. While you eliminate fuel costs (like Hydro, Geothermal, and some other power generation), you add in lots of new hidden costs like much higher maintenance costs and a much shorter lifespan of the plant (meaning the amortized costs of the plant aren't nearly as good as the build costs make it seem), and of course, solar generation stops working at night and cloudy days, Solar is unreliable peak power -- not base power. All this means that a Solar plant isn't just the cost of the plant and free fuel to get reliable base power. It is certainly misleading to claim 1 MWh of peak production (Solar) is the same as 1 MWh of base reliable production -- which is what the flim-flam Solar Power advocates claim. Solar energy costs = infrastructure costs + higher maintenance + lower lifespan + battery storage + extra capacity (to charge the batteries as well as supplying power) + backup power plant (for when it's cloudy or night time). Residential solar is a bit different than industrial solar -- but not because of economics as much as because of politics, subsidies, regulation and policy. 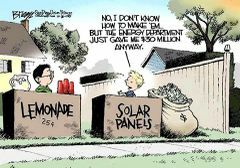 If Solar was cheaper, then it wouldn't need subsidies. Anyone could see that the benefits would outweigh the costs without them, and there would be widespread adoption. In other words, I could look at the costs of a solar system (say $10,000), and figure that with a $200/month energy bill, that means a 50 month (4 year) break-even. Which would be a good enough return. In reality, it's more like $20K to get peak power up enough to eliminate your bill... and another $10K to get the excess capacity required to charge for night, and another $10K for the storage and infrastructure costs. So at $40K you break even is about 17 years (without interest/opportunity costs of capital), on something that has a 20-25 year lifespan? So no one would buy it. Thus you need subsidies. (And that's with inflated California city electric bills, if you go to place that cost 1/2 that, it's even worse for solar). Remember, it was really cheaper, then they wouldn't have to incentivize it, or demand it as part of building codes (as California is threatening). The "it's cheaper" argument falls on its face, on the individual transactions, but more so at scale. (They're losing money with every kilowatt, but trying to make it up in volume). If Solar is cheaper then when you look at costs per/KWh, there should be a nice correlation in price to reflect the savings. But the inverse is close to the truth. Italy ($.21), Germany ($.31), Spain ($.23), Denmark ($.31), France ($.17). and U.S. ($.12). Wait, that's the exact opposite of proof that solar drives down costs. Of course some of that is because Solar is such an anemic percent of their electric generation, and some is because of taxes. 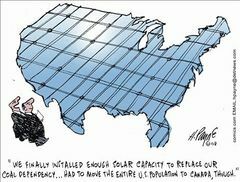 And the reason why energy taxes are higher, is to subsidize the cost of building all that solar (and other "renewables). So France has cheaper electricity than its neighbors, not just because of less Solar, but because so much more of their electricity is generated by Nuclear or other power. Also, because of their higher population densities, their distribution systems should make their energy much cheaper than ours -- but yet, it is more expensive. Total renewable energy consumption by country: Italy (17% - mostly hydroelectric ), Germany (34% - mostly wind), Spain (43% - mostly wind), Denmark (57% - virtually all wind), France (20% - mostly hydroelectric). and U.S. (12% - mostly biofuel/biomass). Are you noticing that Solar isn't the top renewable energy in any country, even ones that are heavily invested in renewables? Are you saying all of them are choosing more expensive (and often less reliable) wind? Of course hydroelectric and bio-forms are both more reliable, which is why the U.S. and others pick them first. But that too belies the whole myth that solar is cheaper. NOTE: One of the many reasons the Europeans are so ignorant about energy prices is because some of it is hidden from them. Like in Germany (and elsewhere) they are income taxed to death, and some of that tax goes into subsidizing their own consumer electricity costs. So their bills they see have price/rate caps (for some people), to make it look like they're paying less. But as a country, they're paying it, just out of their taxes/paychecks and not on their bills. It's anti-transparency in government, also called Socialism. There's also a secondary flim-flam going on in California (and states like it). Cali loves to cut its domestic production and go renewable (like Solar), so they get to claim they're greener based on how much of their domestic energy is produced by green technologies. But the truth is they then reduced base capacity. When the days are cloudy or not windy, what do they do? They buy electricity from states further away (often running oil or coal). The truth is they replaced local NG or Nuclear, etc., with remote coal/oil (at least part of the time), which doesn't average out to be nearly as green as their voters/rubes think it is. And they have to pay a premium to ship in power from other states when theirs isn't working. All this jacks up the prices to California consumers, and increases the actual total pollution or CO2 per KWh (at least part of the time). But since it exported that pollution (CO2) to other states, and their base is gullible enough that they don't understand that they've been had, it's still a win for the politicians or the green-energy kooks that care about their religion more than the math, logic or economics of what's really happening. NOTE: There's another gotcha game going on -- renewable energy drives up the costs of regular energy, to make the difference seem smaller than it really is. you have a Natural gas (NG) power plant, it's reliable and produces 1GW. You add a Solar Plant (SP) that produces 1GW, but it's unreliable. You pass a regulation/law that says people should use the Solar power first. So when the sun is out, the NG plant still has to be there (and usually running because of spool up/down times), so it is producing wasted electricity that no one is buying. But you need it for off peak times, and when the clouds are out -- then it gets to sell it's electricity. Since creating a peak power plant encroached on the reliable (NG) plants sales cycle, that means the cost of maintenance and operations for the NG plant is higher, and they have to pass that on to consumers. Even if waste electricity is still being produced. Solar raised the price of operations or electricity from the NG plant, by not being reliable. The NG plant is still burning CO2, just the electricity isn't being used (or is being captured in storage, which is less efficient than using it is). There's a little more nuance, in that you can build a fast spool plant, and bring it up/down quicker (called a Peaking Power Plant) -- but that's still new infrastructure to replace perfectly good infrastructure you already had. And fast spool plants run less efficiently. Whether you use Base load, Peaking or Load Following Power Plants, either way building two plants to replace one (or using one at less than full capacity) is a waste -- and required so that it can backup the Solar plant. Any of which cost you in money, time, CO2, pollution, and you don't really come out ahead (or much less than was promised). But if the politicians and polemics duped the gullible rubes into thinking they did something for the environment, and you get to jack up their prices for the privilege of being green, that's what really counts, isn't it? Whenever the advocates claim how much cheaper solar is, I ask them to show their work. I can be convinced... show me the math that shows where Solar + Batteries + backup plant (sans subsidies) is cheaper than just the backup plant + fuel costs (per KWh), and I’m all ears. But to date, no one has been willing to do so. To be fair, I've only been trying to find an honest solar power advocate since Jimmy Carter first got enamored with Solar during the oil crisis in the 1970's. I can't even find one that will admit any point against them without changing the topic. But if they can't do that, they prove they're not yet up for a big-boy discussion on the topic. If solar was so great, then why don't governments buy into the hype and invest into it more, for all those savings? The biggest countries are at 7%, and that's because Italy has less industry than say Germany (6.5%) or France (1.6%). 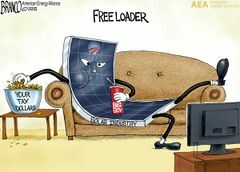 So the emotions and dishonesty of the Solar advocates make me want to spoon feed them their medicine until they grow. Face it, if you have to lie for a cause and you can't admit uncomfortable truths, then you just don’t have a good cause. (Or you're not a good person). The way California regulations work is that it's cheaper to run your own local inefficient generators than pay the penalties for not producing power: so many green sites build on-site natural gas or oil backups, for when the sun is out. And that means the biggest solar plants in the state, are also the biggest natural gas consumers in the state. Not as green as you think, huh? But since Greens are rubes, they either don't know, or don't care -- their agenda is more important than reality. 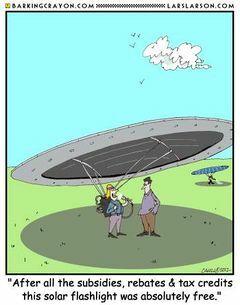 Thermal Solar does the same thing. When the sun isn't out, they use natural gas to heat up what the sun would have -- thus it becomes a natural gas plant. So it's not really a Solar plant, it's a hybrid plant with some propaganda attached.